If you have never collect the free step tracker watch from Season 1-2, now is the time! last year rewards is NTUC vouchers, this year i still not sure. Sign ups for Season 3 will start 29 September 2017 onwards. Only Singaporeans/Permanent Residents who have signed up for National Steps Challenge™ Season 3 and who have not received the HPB steps tracker previously will be eligible for the free HPB steps tracker, available on a first-come-first-served, while stocks last basis. Last edited by TwentyOneDegrees; 05-10-2017 at 10:42 PM..
You may collect your HPB steps tracker* at the following roadshows, available on a first-come-first-served, while stocks last basis. Members of the public are encouraged to check www.facebook.com/HPBsg for updates before heading down to our roadshows. Last edited by TwentyOneDegrees; 25-10-2017 at 12:22 PM..
Last edited by TwentyOneDegrees; 07-10-2017 at 01:22 PM..
Sign up for National Steps Challenge™ Season 3 on the Challenges tab (available 29 Sep 2017 onwards). Complete your set up by selecting your preferred steps tracking mode. Above is for android phone. For iPhone use sync mi band to health kit and use healthkit to sync to healthy 365 app. Its rather buggy but probably the best methods I know currently. 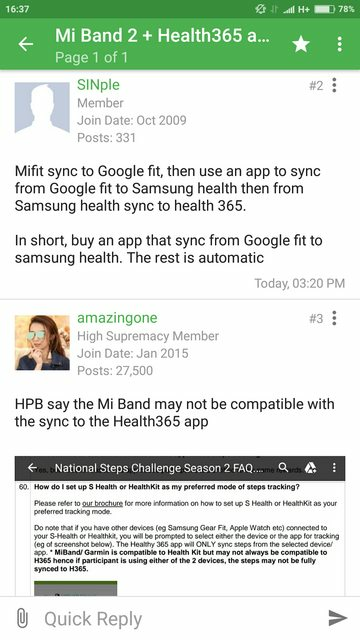 According to their FAQ, even though MIBand are compatible with the Health Kit, but it's not compatible to Healthy 365 mobile app. So people using these the devices will not be able to sync their steps on it. Last edited by TwentyOneDegrees; 09-10-2017 at 10:02 PM..
Avoid syncing during 11.45pm - 12.15am, sometimes have error during this reset timing. Last edited by TwentyOneDegrees; 09-10-2017 at 09:32 PM..
No need, just go the roadshows early or on time! Last year i see people queue for 2hours+, i happen to have a priority slip so queue for 30mins only. The step tracker is semo brand de? This is Season 2 watch by ACTXA. Other brand step tracker watch can also participate one. Mi Band not sure. You visit the website and see how to sync your watch.